Produced for Davy D Productions. Recorded and mixed at Power Play Studios. 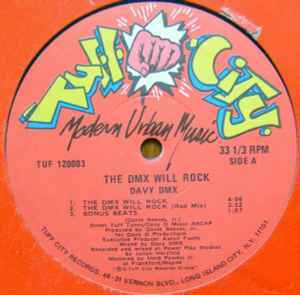 Published by Street Tuff Tunes / Davy D Music (ASCAP). Both the scratch mix and the instrumental ROCK. Classic Davy D & a classic electro track, essential along with 'One For The Treble' & plenty o copies here... get stuck in. A1 The DMX Will Rock is a pukka tune, really good track to mix in and out of..Just a track to own..simple as that.